Sale Bracelets There are 13 products. 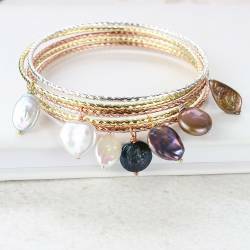 Stunning shades of purple and mauve including amethyst, lavender amethyst, glass chips and freshwater pearls on silver or gold plate wire and frame. Stunning contrasting black and white cuff wth black onyx, snowflake obsidian, crystal, hematine, moonstone and freshwater pearls on silver or gold plate wire and frame. 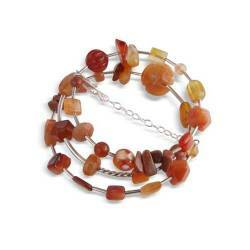 Lovely rich golden shades of amber, carnelian, citrine, garnet and freshwater pearls on silver or gold plate wire and frame. 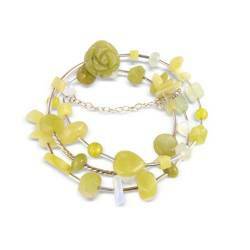 Soothing shades of green including aventurine, peridot, malachite and freshwater pearls on silver or gold plate wire and frame.These crochet cuffs look stunning on for day or evening wear. Pretty in pink, including garnet, rhodocrosite, rose quartz and freshwater pearls on silver or gold plate wire and frame. Gentle shades of blue including sodalite, blue lace agate, iolite, blue quartz and freshwater pearls on silver or gold plate wire and frame. 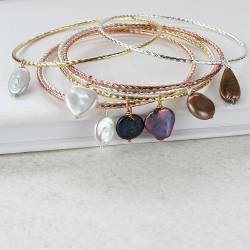 So pretty, blending crystal quartz, freshwater pearls and rainbow moonstone on gold or silver plated wire. 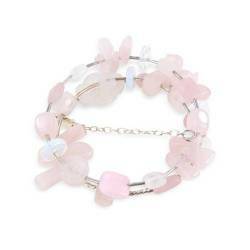 These bracelets look absolutely stunning on for day or evening wear.